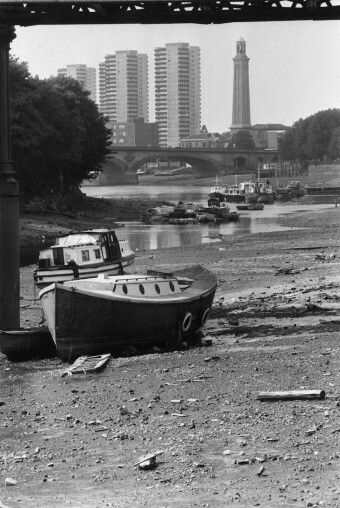 Water was in short supply in England during the summer of 1976. Officials understood as early as September 1975 that water levels would be low the next year thanks to 1975 being the fifth driest year of the 20th century in the region. While an average of 278 millimeters, or nearly 11 inches, of rain fell on England between May and August from 1916 all the way through 1950, only 140 millimeters or about 5.5 inches of rain fell during the same time period in 1976. 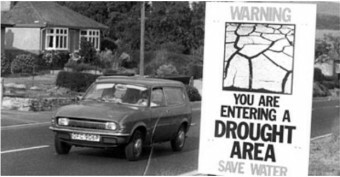 The months between April 1975 and August 1976 ultimately marked the driest period for the region in recorded history, with data going back well over two centuries. If the dry weather wasn’t bad enough, abnormally high temperatures made a bad problem even worse. Temperatures soared in the early summer, reaching daily highs over 32 degrees Celsius, or nearly 90 degrees Fahrenheit for a record 15 consecutive days from June 23rd to July 7th with the surrounding weeks also being much hotter than normal. For a country not only running short of water, but also largely without air conditioning, the whole thing was a sweaty mess. No one had ever seen so many ladybirds – a colleague remembers the sound they made when you walked on them – crunch, crunch, crunch! – and the absence of green on the ground was made up for in the air by apocalyptic swarms of aphids [ladybirds]. But if a person decided to take a bath, the government and national newspapers like the Times and the Sun had helpful hints so as not to waste the used water. For instance, at one point the government suggested “Save water, bath with a friend”, which was soon a slogan that found its way onto T-shirts, bumper stickers, and other such product across the nation. Newspapers encouraged readers to reuse old bath water by using it to water plants in their gardens or dumping it into toilets in order to use it to flush with. 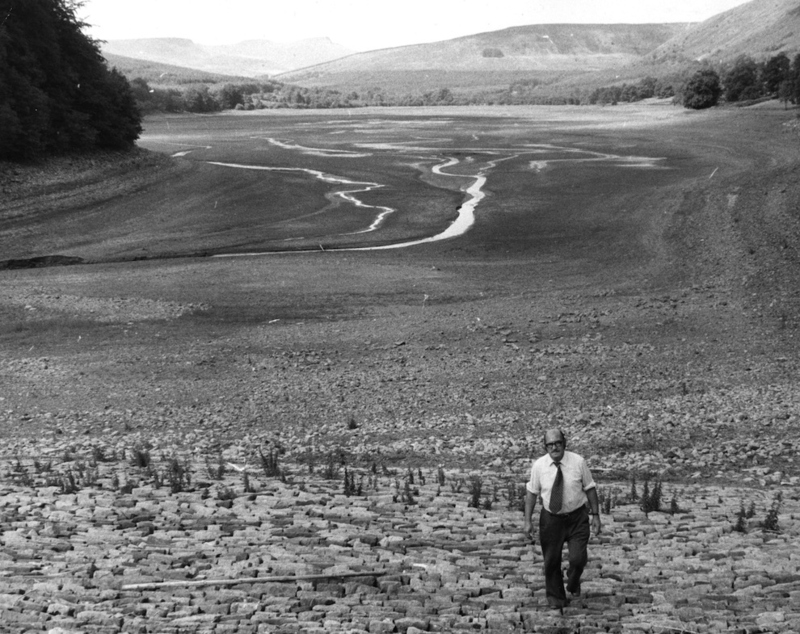 Water became so scarce that water companies could no longer supply tap water to certain areas in Wales and England. They instead installed standpipes, upright and freestanding metal pipes with a tap, for residents to get needed drinking water. The use of hoses was also banned in some areas with cars patrolling neighborhoods looking for offenders, ready to hand out a steep fine up to £400. Officials’ big fear was the impact of the drought on the economy. Businesses in industries that used a significant amount of water warned that forcing compliance with water restrictions would lead to a decrease in work for their employees and fear of a three day work week. While businesses certainly felt the squeeze from the drought, such as seaweed processing plant forced to lay off all of its 125 workers when the nearby reservoir dried up, others rose to the challenge. Breweries across the country claimed to have reduced their water use by between 14% and 25%. One food production company reported cutting down on their water use by 90% simply by changing how they cleaned bottles. Despite the water restrictions and the fears of how they would hurt workers, English citizens did not see much of a change in the unemployment rate as a result of the extreme drought. Water restrictions also applied to sporting facilities, such as horse race tracks, golf courses, and rugby fields. Those locations that decided not to abide by the rules and watered their grass anyway faced repercussions from busybody neighbors. For instance, women in Surrey took issue with a local golf course and its groundskeepers who decided to water the greens to keep them abiding by their name, despite the restrictions. They staged sit-ins at the course, even staying overnight to make sure the sprinklers never turned on, as well as harassed the club’s employees. Their methods worked, and the golf course stopped watering its grass. Politicians passed legislation known as the Drought Act in early August to help curb water usage. They also formed a Cabinet Drought Committee to make recommendations on how best to get the country through the ordeal. 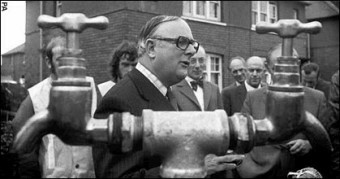 Prime Minister Jim Callaghan even appointed his sports minister, Denis Howell, to the position of “Drought Supremo,” in charge of coordinating water conservation efforts; it was joked that Howell must have really got on the wrong side of Callaghan to be given such a position that was virtually guaranteed to make sure nobody in the public liked him. Beyond many suggestions, like putting a brick in one’s toilet tank to reduce the water used in a flush, Howell warned citizens the water restrictions would be in place until at least December. But within days of the Drought Act being passed, it rained during the August Bank Holiday. At first just a trickle, ultimately the rainfall began to ramp up into September and October, with the following year being abnormally wet. Howell soon became extremely unpopular due to continuing to try to enforce restrictions despite the heavy rainfall, sensibly wanting to get the reservoir levels back to normal before easing up on restrictions; for his diligence to his duty, he was ultimately derisively dubbed the ‘minister of the floods’.